Nothing is more satisfying than a home-made lunch, a South Indian one in particular. It doesn’t have to be an elaborate thaali to make it comforting. A simple meal of hot rice, aromatic rasam, an accompanying veggie side dish, yoghurt and Ajji’s Avvakayi pickle…aahhhh bliss! This afternoon, after a really long time, I made a new rasam which my mom-in-law told me about. It was a change from the usual rasams I make. 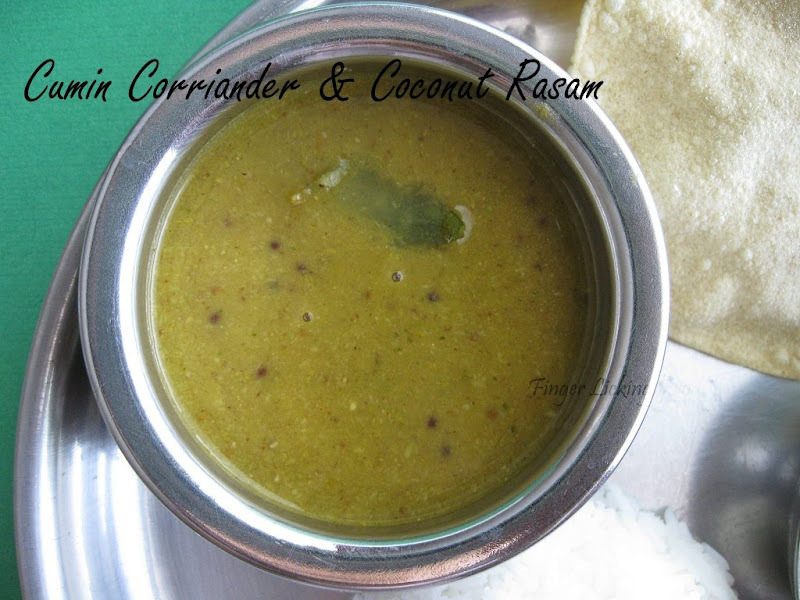 Made with Cumin seeds, Corriander seeds and Coconut; hence the name CCC Rasam. To go along with it I made an Eggplant side dish. Powder the dry roasted seeds in a blender. Add the roasted green chillies, coconut and coriander. Also add the boiled tuar dal and tomatoes. Blend together till the dal is completely mashed. Transfer to a vessel and bring to a simmering boil on medium high heat. Add the jaggery, tamarind paste, salt and curry leaves. Bring to a full boil and then turn off heat. Add mustard seasoning. Heat oil in a non stick pan, add mustard seeds. 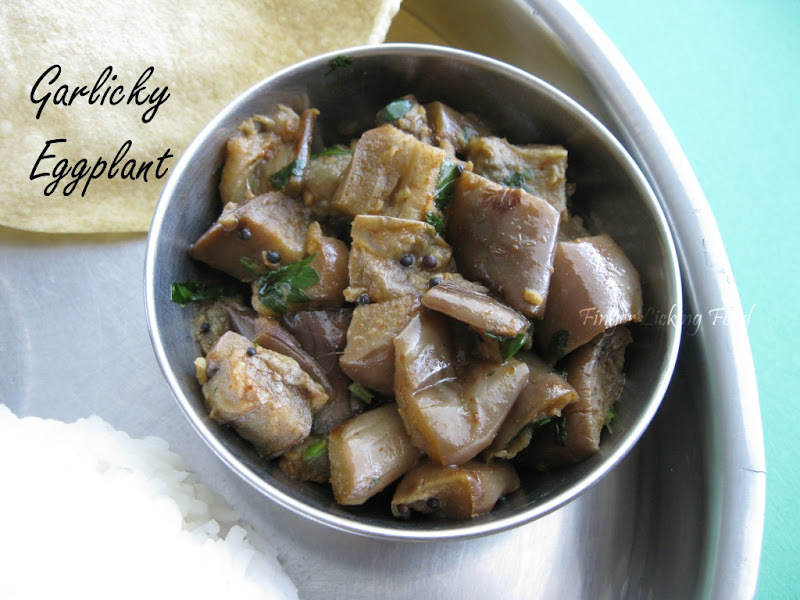 Cut eggplant into bite size pieces. When they begin to splutter, add cubed eggplant and toss to coat with oil. Cook on medium heat till the eggplant is soft. Add the grated garlic, chilli powder and salt. Mix well and let the garlic cook for a while. Remove from heat. This was a perfect meal for a lazy Saturday afternoon. I think its time for a siesta! (Yawn).. Thank you for stopping by my blog, Namratha. I like your acronym for the rasam. Palatte looks inviting! Great Dishes! home-made lunch is best and this thali is making me just hundry..it's lunch time here LOL..
and i liked the beautiful pictures you shared with us in previous posts ...thanks for that..i am sure this is even much more beautiful and breath-taking in real..
good recipes with colourful pictures. 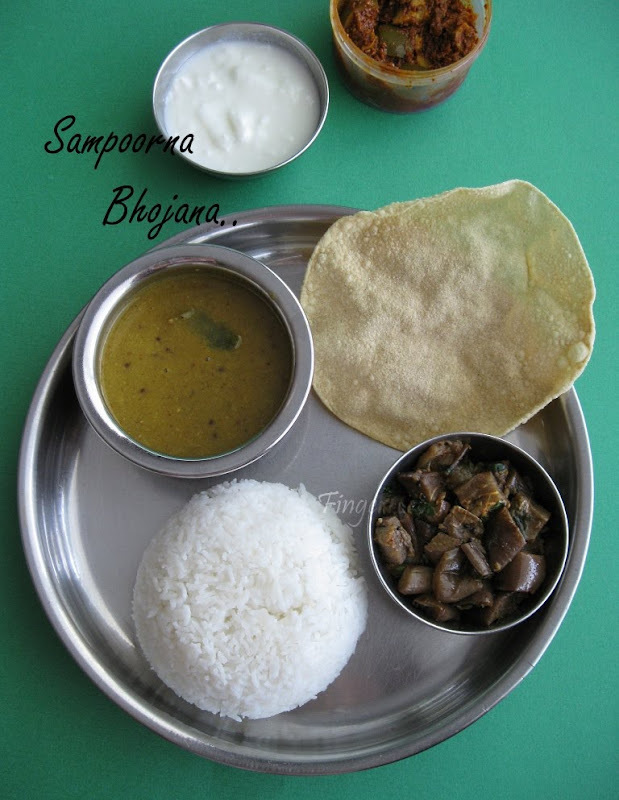 recently ihave started to blog Karnataka recipes. Liked the rasam a lot Nams, had made it today. Thanks. This is so quick to make and yet delicious! I will be making this for dinner tonight. I love eggplants!